The Emmy Award-winning composer who created the ambient sound, sound effects, and theme song for the Selene videogame developed at the Center for Educational Technologies debuts his collaboration with Grammy Award-winning musician Wynton Marsalis tonight on PBS at 9 p.m. The American premiere of Marsalis' "Swing Symphony (Symphony No. 3)" will be broadcast as part of the New York Philharmonic's opening night celebration. Selene composer James Oliverio, professor and director of the Digital Worlds Institute at the University of Florida, was heavily involved in the orchestral preparations and rehearsal notes for the Berlin Philharmonic Orchestra's world premiere performances of "Swing Symphony" this past June. According to Oliverio, the performances in Berlin, considered by many to be the epicenter of European classical music, were received with standing ovations. 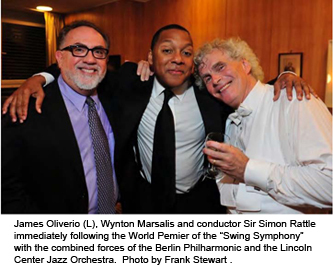 Credited as Marsalis' orchestral consultant for "Swing Symphony," Oliverio also wrote the program notes for the New York Philharmonic premiere. Oliverio has previously worked with Marsalis and the Jazz at Lincoln Center band on other large-scale projects. Oliverio holds five Emmy Awards from the Atlanta chapter of the National Academy of Television Arts and Sciences, along with numerous national grants and commissions. His work in internationally distributed performing and digital arts has been featured on CNN International and the BBC. In addition to performances of his orchestral scores by ensembles including the Cleveland Orchestra and the symphonies of Atlanta, Pittsburgh, and Columbus, Oliverio has produced for and collaborated with Jazz at Lincoln Center, the New York Philharmonic, the New York City Ballet, and the Film Society of Lincoln Center. Selene: A Lunar Construction Game was funded by NASA to study how to best use videogames in the teaching of NASA science concepts. The game is now part of the National Science Foundation-funded CyGaMEs project, an approach to instructional game design and embedded assessment.